I bought this book in anticipation of a trip I would be making last year and began it while I was visiting Concord, which you can read about here. 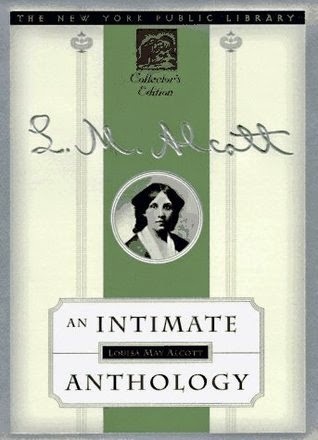 Louisa May Alcott is an author I admire almost as much as Lucy Maud Montgomery, and that's really saying something. This collection is an excellent find for someone who, like me, knows Little Women back to front but wants to find out more about the author behind it. There's a little bit of everything here: biographical sketches by those who knew her and selections of her diaries, poetry, letters and short stories. The more I read, the more I was impressed by how ahead of her time Alcott was (as is the case in all the historical women I admire). She understood the need for women to exercise, to learn and to be independent. She had a sensitive and humorous understanding of society (G.K. Chesterton compares her to Austen) and advocated for women's rights and abolition long before it was fashionable to do so. It is very difficult for me to separate the March family from the Alcott, and in fact when I visited Orchard House I had the disorienting experience of seeing both at the same time. There are three very personal autobiographical sketches in this anthology. In "Transcendental Wild Oats," Alcott paints a very vivid picture of her family's somewhat horrifying experiment with living in a commune at Fruitlands. A hundred years before hippies made it popular, Bronson Alcott was advocating for peace, vegetarianism and brotherly love. Unfortunately his lofty ideals couldn't support his family for long. Particularly interesting to the history buff in me are the letters that comprise "Hospital Sketches," detailing Louisa's ill-fated experience as a nurse during the Civil War when she was thirty. How exciting to read about the war firsthand from a woman my own age! Unfortunately the experience doesn't last long, as Louisa developed typhoid fever and never fully recovered. Perhaps the most amusing story is "How I Went Out to Service," chronicling a time during Louisa's youth that she went to work as a companion and ended up being taken advantage of by the family. She ends up leaving in disgust but the family's vulgarity provides much fodder for amusement. In addition to the lively glimpses of her life are some of Alcott's delightful stories. "Debby's Debut" is a classic love-triangle story, with the "right man" obvious from the beginning. "Pauline's Passion and Punishment," an early story of Alcott's, is a drawn-out melodrama that could easily have been one of the thrillers Jo March pens to amuse her sisters. "Perilous Play" is actually about the dangerous effects of (shocker!) drugs. Didn't I tell you she was ahead of her time?